After watching Manny Pacquiao's victory against de la Hoya yesterday, I went out to meet my bestfriend Czarina at Robinson's Malate. I asked her if she could help me shop for a pair of shoes that I could use for Thanksgiving at church next week. As always, she said yes to my invitation without hesitations. So we met up and it was only then that I knew she was wanting to watch Twilight. I felt bad because I didn't ask her beforehand. I know I disappointed her when I told her that I have seen the movie last week with Michelle. I insisted that it would still be fine with me if I'll watch it again. But she said that we'd rather watch a different movie because for sure I'm not gonna restrain myself from telling her what's going to happen on the next scenes. Hahaha! She knew me that well. 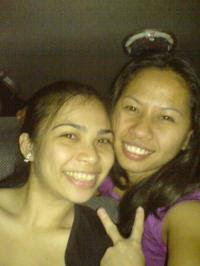 Czarina was my classmate during my college years at Mindanao State University but we were like friends since forever! hahaha! Apart from being pretty (wink!) we have a lot in common that's why we clicked. But to be honest, she's way too pretty than I am! She's really fun to be with and she's the bestfriend one could ever want! Anyway, off we went to watch Four Christmases by Vince Vaughn and Reese Witherspoon. It was all about a couple who are happily unmarried and chooses to be unmarried until they spent Christmas with their families in an untimely manner. They were supposed to go on a vacation which they do every year just to avoid their families on Christmas. However, their flight was canceled because of an unexpected weather condition. They had no choice but to spend the holiday on four houses. Only then that they discovered that they knew little about each other. This visits to their families made them both think about their future with each other. Well, is there going to be a future for them? It's for you to watch! As for me, the movie was just fine. I didn't go gaga with it (unlike my impression with Twilight). Maybe because it was just a typical love story for me. After the movie, Czarina and I bought a pair of shoes as planned. We parted ways around 7pm because I have to attend to a seminar at church. I had fun with Czarina as usual. I hope we could spend another bonding times together. We seldom see each other lately because we have different priorities now. But then, we make it to a point to get reunited every once in a while. One of our bonding moments together!!! Mag tan-aw unta mi ana ugma 4 xmas, fine ra d-i cia hehe!unta naay uban pa na nindot palabas ugma oi kay duha na ka movie(last week) na poro bitin ang ending..dimalas jud. Great u had fun, Bang! Thanks for doing the drops this morning. I panicked, can't get online when I woke up 4am. Buti nalang naayos ni Mark pagkahapon before I went home. May nadisconnect ata na wirings. May panata kami early a.m. till next week, sigh! ok ra man ang movie... wa naman gud la-in sa sinehan,hehehe... pero somehow ma appreciate man sad nimo. happy man ang ending ani. typical love story lagi.. ingat! te oks lang! bakit sigh sa panata? sige ka nyan, pag lagi ka sigh dili mabiyaya imong pasalamat,hehehe... ingat te! mwah!